The recent worldwide financial crisis has once again brought the topic of globalization to the forefront of public discourse. Questions like will the Eurozone survive its fiscal crisis in its present form, is the large and persistent current account deficit of the United States worrying, and what geopolitical and economic role will China play in worldwide affairs are dissected by academics and policymakers. These questions are complex and answers are often nuanced and couched in language that non-specialists find confusing. 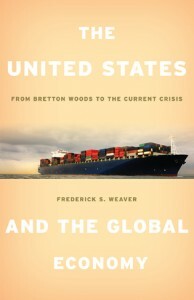 In The United States and the Global Economy: From Bretton Woods to the Current Crisis, Frederick Weaver, professor emeritus of economics and history at Hampshire College, gently introduces readers to the post-World War II international economic landscape, a landscape that is evolving rapidly. While Weaver provides readers with an entertaining and thought provoking journey through the last several decades of global economic and political integration, his readers are often presented with a one sided quasi-Marxist interpretation that leaves more questions than answers. Weaver attempts to accomplish two major goals in the book’s six chapters. The first goal, and central theme of the book, is to explain how “international events, issues, and relationships reflected and shaped changes in the U.S. economy” (2). His singular focus on the United States is due to the post-World War II dominance of the U.S. in global economic affairs, a dominance that Weaver suggests is lessening as other international geopolitical organizations (i.e. the European Union, the Organization of Petroleum Exporting Countries (OPEC), the International Monetary Fund, etc.) seek to establish themselves as permanent and powerful players in the international setting. The second goal of the book is to supply the reader with the necessary vocabulary to follow and understand the globalization debate. Weaver defines key concepts in international economics such as the current account, the trade balance, foreign direct investment, and what it means for a nation to be a “most-favored” nation in trade agreements. Weaver balances these two goals around his unifying theme of analyzing whether the current form of globalization is stable enough to last. The opening chapter sets the stage of how the United States became the global economic and political leader. The chapter emphasizes three major threads. First, Weaver discusses the United States’ role in the international economy before World War II, briefly explaining how the United States transformed from a largely inward-focused economy with political isolationism to a major player on the world stage. Second, Weaver explains the Bretton Woods conference of 1944 and the dollar exchange standard it established. The dollar exchange standard made the U.S. dollar the world’s most important currency, providing international monetary stability. Lastly, the first chapter introduces some of the important economic institutions created to stabilize the worldwide economy, which experienced a wave of disturbances between the first and second world wars. The second chapter introduces the reader to the “golden age of capitalism” in the U.S. From 1945 to the early 1970’s, the U.S. was the world’s dominant manufacturer because of the new dollar exchange standard, minimal foreign competition, and because the U.S. was the only major industrial producer not to have suffered catastrophic damage from World War II. Weaver names this period the “Modern Times” and emphasizes the relationship between owners of capital and labor and the rise of transnational corporations. During this period, Weaver illustrates that the U.S. economy was dominated by large oligopolies that worked with labor unions to establish “high wages and benefits in exchange for control over the organization of work” (37). This bargain was successful because the limited foreign competition made it possible for these firms to push labor costs onto consumers in the form of higher prices. The transnational corporations of this period were fueled by American foreign direct investment and manufactured modern consumer goods abroad to sell in foreign markets rather than exporting them back to the U.S. In chapters three and four, Weaver argues the stability and economic success of the Bretton Woods framework led to the system’s collapse, creating international instability. Weaver argues that when the U.S. officially suspended the convertibility of the dollar into gold, this decision caused two large unforeseen consequences: the strengthening of OPEC and the debt crisis of the third world. OPEC’s increased strength was a consequence the international price of oil being denominated in U.S. dollars, a currency devalued by the suspension of the dollar exchange standard. OPEC was able to use this situation to increase the price of oil, partially causing much of the developed world to fall into periods of stagflation (rising inflation and stagnant or falling output). In response to the rising inflation, the United States’ central bank tightened monetary policy. This increase in interest rates made it more difficult for developing countries to pay back their international loans. By the early 1980’s, a debt crisis emerged among developing countries. This debt crisis haunted much of the developing world throughout the 1980’s as they suffered from sub-optimal economic growth and bouts of inflation. The breaking of the Bretton Woods system also disrupted the “Modern Times” structure in the U.S. As the U.S. opened to global competition, the capital-labor relationship changed along with the role of the transnational corporation. Increasing imports into the U.S. created a situation where the high compensation sectors of the U.S. economy became unsustainable. Weaver argues that owners of capital used their newfound bargaining power to force workers to accept lower compensation or risk losing their jobs to workers overseas. At the same time, manufacturing moved towards mass production of consumer goods, work often completed with lower skilled labor outside of the U.S. The changing economic landscape influenced the political landscape. Chapter five describes what Weaver calls the “triumph of free-market global capitalism.” Policymakers eagerly embraced more competitive domestic markets and international competition. Weaver questions the wisdom of this shift and argues that the new embrace of private market solutions regulating the market will lead to a race to the bottom as transnational corporations seek the lowest cost environment to produce their goods and services. Weaver’s narrative of how the international economic order has changed since the end of the Second World War is often compelling and informative, despite its brevity. The book is well paced and an easy read despite its serious topic, giving readers without background knowledge in economic or international affairs a good starting point to understand the rapid changes in the international economy. Weaver has the ability to seamlessly define and discuss the sometimes confusing jargon of international economics and provides throughout the book helpful side notes that add to the narrative but do not unnecessarily distract the reader from the book’s core insights. Partly due to Weaver’s attempt of simplifying a complex topic for a general audience and partly because of Weaver’s insistence of viewing the world through a quasi-Marxian lens where labor and owners of capital are locked in an inherent struggle, the book displays some serious weaknesses. The first weakness is the numerous factual errors throughout the book, most which occur in the book’s last chapter. On page 72, Weaver writes that the federal budget was in surplus from 1979 to 1981 when a simple check of the Historical Tables of the President’s Budget from the Office of Management and Budget show federal deficits in each year. While discussing the Asian financial crisis of the late 1990’s, Weaver mistakenly blames the financial crisis with the crash of the Russian ruble in 2009, when Asia’s financial crisis helped contribute to the Russian currency crisis in 1998. On page 135, Weaver claims the Euro was introduced in the early 1990’s when it was introduced on January 1, 1999. While these mistakes are relatively minor, they are unnecessary as they are easy to confirm and correct. A second and more serious weakness of the book is the numerous questionable interpretations or unsubstantiated claims littered throughout the text. Some of the more egregious examples are the following. When discussing the role of U.S. policymakers dealing with the Great Depression before President Roosevelt, Weaver repeats the tired myth that policymakers relied on market mechanisms to stem the crisis rather than “actively incorporating labor movements into politics and creating social insurance, relief programs, pensions, and other supports for their hard-pressed citizens” (15). When explaining why the economy of the Soviet Union suffered from economic malaise in the 1970’s and 1980’s, Weaver inexplicably claims “…that the exhaustion of the Soviet model was due to the command economy’s unprecedented success…” (66) instead of the knowledge problem inherent with socialist economies. While Weaver correctly notes that the federal budget deficits of the 1980’s were partly due to rising military expenditures, Weaver insists the Reagan tax cuts were also to blame when a check of Table 469 of the 2012 Statistical Abstract shows that federal tax revenue increased during the 1980’s. Weaver even goes as far as to write that the impact of immigration in to the U.S. has “fostered a resurgence of sweatshops…similar to those of the nineteenth-century United States but currently more evocative of Third World relations of production coming to the First World.” Considering the seriousness of the accusation, Weaver does not provide any documentation or even an example to substantiate the claim. The largest weakness of the book is the simplistic and one-sided account of the U.S. financial crisis in chapter six. Weaver blames the typical cast of characters for plunging the U.S. into recession: currency speculators, large financial institutions, and deregulation. Weaver never discusses how the Federal Reserve allowed Nominal Gross Domestic Product to fall in 2008-2009 by the greatest amount since the Great Depression. While lamenting the role financial institutions played in the housing boom and bust, he never presents the reader with the possibility that government policy provided the incentives for risky lending or that absent the Glass-Steagall Act, securities issued by unified banks were of higher quality than those issued by stand-alone investment banks. Weaver also praises the “success” of the Trouble Asset Relief Program because it “created or saved between one and 2.1 million jobs” but never explains to the reader that the concept of “saving jobs” is not an objective measure and subject to much interpretation. Finally, Weaver implies that the recent U.S. economic recovery is generally robust, even though the output gap is substantial (as of the 2nd quarter in 2012, it measured about $863 billion) and U.S. GDP is growing slower than its long-run trend. The United States and the Global Economy provides non-specialists an introduction to the complex world of international economics, while providing an unorthodox interpretation. If the reader already accepts the quasi-Marxist framework of Weaver, the book will be pleasing. However, if readers are looking for a more balanced approach or if an instructor is hoping to assign this book for a political economy or international economics class, this book is not recommended.